Just getting started in photography? Still struggling with when to use a particular aperture or shutter speed? Wouldn't it be great if there was a simple cheat sheet to point you in the right direction? Wish granted! Check out this handy "Where to Start Chart" by MeFOTO's good friend, Mark Wallace. Designed to help a beginning photographer figure out the correct camera settings, this flowchart uses simple "yes" or "no" questions to lead you to a logical solution. The best part? The chart is an interactive pdf connected to hundreds of Marc's free video tutorials! So if you're following the chart and get to something you don't understand, just click and "Viola!" - question answered. The chart is updated regularly, so be sure to check back for the latest version. Get your Where to Start Chart here. Just right-click and choose “save as”. Want more? Mark and AdoramaTV teamed up to bring you this quick "how-to" on using the chart. The SideKick360 SmartPhone Adapter gets Mom's smartphone out of her hands and lets her join the action. With a tripod-friendly base and a rotating 360° ball joint, this handy adapter quickly switches from vertical to horizontal and locks in any position making it ideal for capturing both photo and video. I love it for it's ability to stand alone on any surface. Perfect for my daughter's impromptu Facebook chats with Grandma! Available in 12 Colors. What's her favorite? 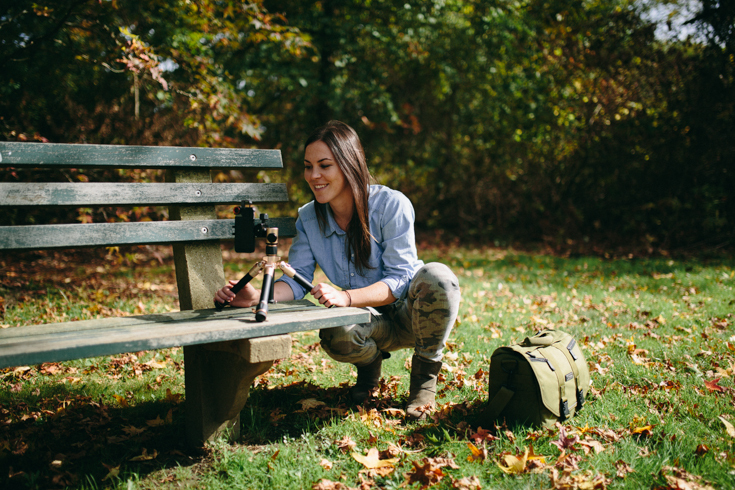 Our smallest tripod kit weighs less than 2 lb. and folds up shorter than an IPad! Mom can easily pop it into her favorite backpack, messenger or even diaper bag. Perfect for street photography, that special Mother's Day excursion or any time she's on the go. Mom's who covet color and are never without their IPhones will love Photojojo's Phone-o-Chrome full spectrum color filter for those special IPhone shots. This tiny filter is cleverly housed in an old fashioned, easy-to-transport slide frame. Holding the slide over the IPhone's lens puts a rainbow of color at Mom's disposal. Now changing a scenes mood is as easy as a finger twitch! 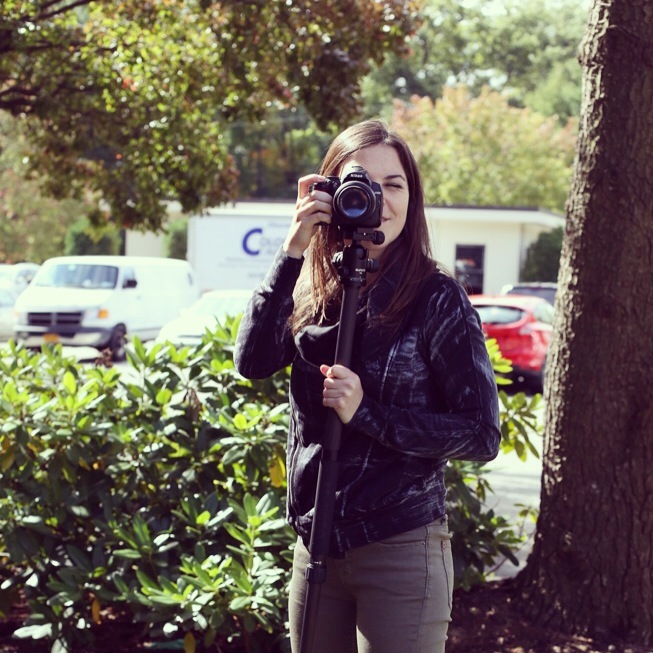 Mom's who care about the sharpness of their photos as much as they care about their families will rejoice when they receive the sturdy RoadTrip Tripod Kit. Supporting up to 17.6 lbs, this tripod will steady even full-frame DSLRs with zoom lenses in a lightweight, colorful package. Induge 2 passions in one! JoTotes offers a nice line of colorful, comfortable bags that don't scream "camera bag". Their popular Gracie bag offers seven spacious pockets with space for a camera body, multiple lenses and an iPad. Available in 7 colors, it's a pretty, practical bag for both photo shoots and day trips. So there you have it...a few colorful ways to honor your favorite Mom and bring joy to her day. We designed our DayTrip to be the perfect 'day-out' companion for a photographer out on a hike, bike ride, or stroll around town. You may not be 100% sure whether you need to pack along a tripod, but this baby is so small and light it pretty much makes no difference if you bring it or not. Then if you come across a photo-op where you do need the extra stability...voila, DayTrip at your service! When out and about, chances are you're carrying your gear in some sort of camera bag, a messenger bag perhaps. The DayTrip is the perfect tripod to put in your messenger bag because it fits inside without taking up much room at all since it can be inserted vertically. The MeFOTO team went out shooting with our Tenba Mini Messengers and DayTrips and it was a huge success. We complied three kits, one for a DSLR shooter, a mirror-less shooter, and an iPhoneographer and found that all kits could fit comfortably, with the DayTrip included, in our messenger bags. I took some photos on my iPhone with the Ollo Clip and gold DayTrip. I used the Joby 'GripTight' mount for smart phones to attach my iPhone to the DayTrip for extra stabilization since I find my hand isn't always the steadiest, especially when shooting from an awkward position. This way I can rest my phone on the tripod and swivel it around to see what the best shot will be rather than firing a bunch and having to sort through endless photos once I'm home. Brian found his titanium DayTrip came in handy since to get such a low angled shot he didn't need to lay on the ground or stay crouched for an extended period of time. Peter used his Nikon D5000 and blue DayTrip to take some photos of a stream in North White Plains. Once again, having a tripod on hand prevented Peter from having to couch or lie on the muddy ground around the stream to get a lower angle shot. In our opinion, one of the RoadTrip and GlobeTrotter's best (of many) features is its ability to be converted into a monopod. When you purchase either model, you're pretty much buying two products for the price of one. ..not a bad deal at all. Thanks to our genius product designers, converting the tripod to a monopod (without tools mind you) is as easy as it gets. But just in case you have questions on how to do it, here is a quick and detailed guide. If there's anything you believe we've missed or would like clarification on, drop us a line in the comments section below. **Please note, not all MeFOTO tripods convert to monopods, only the GlobeTrotter and RoadTrip. Here is the GlobeTrotter in tripod format. 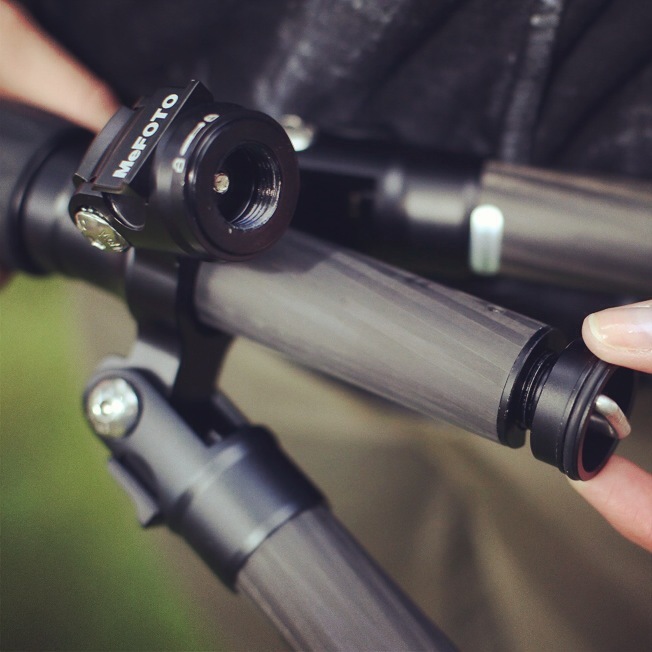 You can convert both the GlobeTrotter and RoadTrip into monopods. 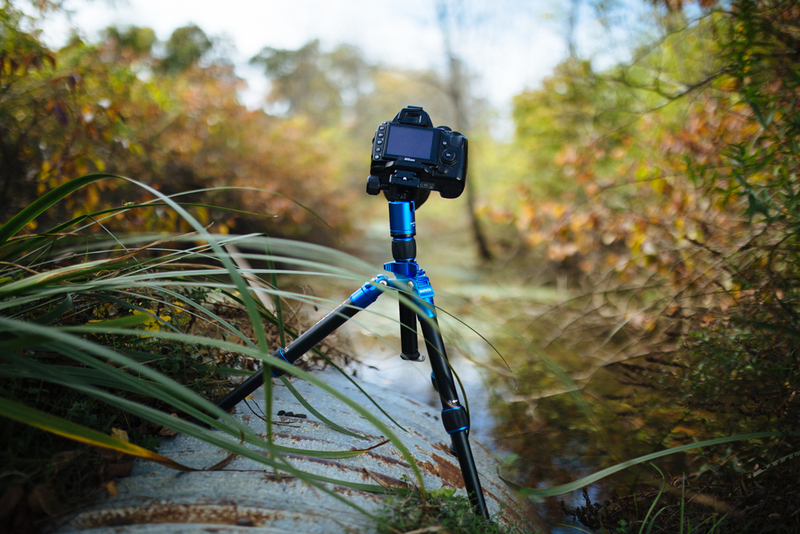 Begin by grabbing the tripod leg with the foam grip and rotate it to the left to loosen it. You will notice the digram at the top letting you know which direction to turn the leg in to loosen or tighten it. Unscrew the tripod leg all the way. Now that you have completely detached the leg, put it down and save it for later. This is the first piece of the monopod. Next you need to remove the center column. This is going to be the second piece of the monopod. Begin by unscrewing the recessed hook knob on the center column. Unscrew the recessed hook knob completely. Save the knob in a safe place since you will need it once you put the tripod back together. Loosen the knob on the center column. Slide the center column out. This is the top part of your monopod. Here is what the GlobeTrotter looks like disassembled. Take the foam tripod leg and center column with ball head attached. These are the two pieces you will screw together to make the monopod. Screw the tripod leg into the center colum. Congrats! You now have a fully functional monopod! We've been getting some feedback that a lot of you aren't 100% sure what all the knobs do on your MeFOTOs. Here's a quick guide to help all you GlobeTrotter owners understand what your tripod can do and how. #1 is the Tilt/Lock Adjustment Knob. This will loosen the ballhead up top so you can shift your camera around to the position you want and lock it. This is also how you can put your camera in vertical mode, when you push the ballhead into the groove on the side. Remember you need to tighten it afterwards so it stays in place. #2 is called the Panning Knob. It is the smallest knob on the side and when you loosen it, you can easily 'pan' the ballhead right and left in a horizontal movement. This comes in handy if you're taking panorama shots or shooting video and tracking a subject. #3 is the Quick Release (QR) Plate knob. Loosening this allows you to remove or tighten the QR plate on which you put your camera. #4 is called a Drag Adjustment Knob (only available on the RoadTrip and GlobeTrotter). It adds tension to the ballhead so if you have a really heavy camera on your tripod it won't flop over or anything when you losen the drag adjustment knob. This allows you to make smaller adjustments on the ballhead. The GlobeTrotter has removable rubber feet that you can unscrew. Included in every GlobeTrotter kit are spiked feet. Once you unscrew the rubber foot, you can then screw in the spiked ones. Spiked feet are helpful when shooting on uneven terrain or when it's windy outside and you need added stability. Loosen the center column knob to adjust the height of the center column on the GlobeTrotter. The GlobeTrotter is able to reverse its center column. For a detailed explanation on how to do this, click here.